The 2018 Betfair Seminar on Automated Trading sold out in only 5 days at £990 per delegate and was massively oversubscribed. We will return again to Langshott Manor on Saturday 2nd March 2019. The 2019 price will be £1,490 but you can grab a £500 discount for all 2018 paid bookings below. One delegate commented in TradeChat on 19th October at 4:44PM that after I set him up at the Betfair Seminar he has made a profit of “€160 odd since Sunday with a €1K bank and am pretty happy here” in the first six days. He was also kind enough to publish the performance of his trading portfolio loaded at the Betfair Seminar which was installed on his Virtual Private Server by me in to his installation of Bf Bot Manager as you can see. The recommended Tagadab VPS is 4 GB of RAM, 4 CPU (those are free with 4 GB of RAM), 50 GB disk size and Windows 2012/2016. No other special features are essential but I select automated backups on all my Tagadab servers. The feedback that I received at the Betfair Seminar was very interesting. Not one of the delegates would have entertained the idea of automated trading on Betfair without attending the JuiceStorm Betfair Seminar On Automated Trading on Saturday 13th October 2018. The strategy portfolio will be free of charge for one year. Renewals will be available at £490 annually which will include all updates and the strategy will only be shared with readers that attend a seminar. Release is limited to a maximum of 20 new users each year. I am aware from the contact that I have had from hundreds of readers at JuiceStorm and elsewhere that setting up a VPS and everything else associated with it is a step too far for many. Another published report from 15th October 2018 to 21st October 2018 in TradeChat starting with a bank of £1,211 returned a respectable profit of £49.61. The cost of the Betfair Seminar will be £990, will last six hours and each event will be limited to only 10 delegates. I will spend the morning checking everybody’s installations – we will start at 10am – and then we will monitor the first few races of the day together before adjourning for lunch. Please bring a laptop as I will set you up on your computer. When setup you can access your VPS from any computer, tablet or mobile. But you never need to log in again unless you wish to. It is completely set and forget. Everyone will have the same settings – it’s a password protected Private Strategy portfolio – with the only variable being your stake which you will set according to your risk profile. Ongoing remote support by myself will be provided if the need arises. Sharing of the strategy portfolio with others will NOT be possible because you will NOT have access to the portfolio passwords. This will, actually, benefit all clients due to prices not being smashed to bits with hundreds of bots doing the same thing. After tea we will consider each delegate’s profit or loss which will vary and look at each individual race traded before we depart for the day. I have set the price at a level which reflects the opportunity that an automated, profitable Betfair strategy portfolio will provide and I only anticipate doing one seminar each year. David Hughes was another delegate who attended the Betfair Seminar On Automated Trading on Saturday 13th October 2018. He was delighted and sent me an SMS to let me know as you can see. He achieved a terrific 31.35% return on his bank and hadn’t even had the time to check how his trading portfolio was getting on earlier. A nice surprise, I’m sure you will agree? But look, here’s the thing. Automated trading is NOT a bed of roses! The results of your trades may differ from the provided examples, the experience you have, and theoretical calculations, while the previous results can’t guarantee the same in the future. The risk factor when using an automated trading platform is considered as high and you should take into account all actual risks while working with such a platform. You should assess all risks that are involved in the operation of the automated trading platform in accordance with your objectives and financial risk profile. If you don’t have additional funds that you can afford to lose, you shouldn’t use the automated trading platform. Any operations involving the copying of trades or specific strategies imply actual risks of losing money. There is no absolutely safe strategy, which excludes risks of accidental losses, as well as no one can guarantee the profit or the total absence of loss. You shouldn’t risk money that you aren’t ready to lose. Operation of all automated trading platforms involves risks of using computer technologies and data flow systems. When you start working with the platform, you should realise that such risks as hardware and software failures and inaccurate external data flows provided by third party service providers, may seriously affect your activities. Neither JuiceStorm.com in general nor any of JuiceStorm.com’s employees bear any responsibility for any bugs or failures. JuiceStorm.com is in no way liable for mechanical or any other damage to communication lines, system or database errors as well as all other failures. 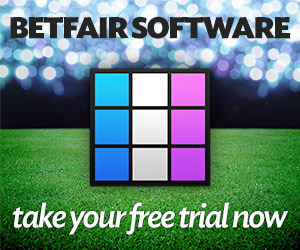 After I’ve mentioned all that – it’s only fair – if you fancy a complete solution for trading on Betfair at only £990 then please click below. But be quick. Last time we sold out in only five days! Did you know you are trading against more and more sophisticated and profitable automated trading algorithms every day on Betfair? Isn’t it time you owned one to compliment your manual trading strategies? I hope to meet some more readers for the first time at Gatwick very soon. There are 147 Guests online and 95 Members Logged In currently reading JuiceStorm.com. Welcome everyone. Join TradeChat for a chance EVERY month to win a year's subscription to TradeSelect - worth £600!